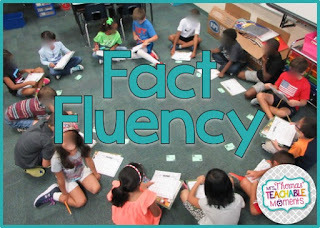 At the beginning of each school year in math, one of the first skills I focus on is teaching my students a variety of strategies to teach fact fluency for recalling basic facts up to 20 with automaticity. I try to put as many tools in their toolbox as I can to help them feel more confident and to differentiate instruction. 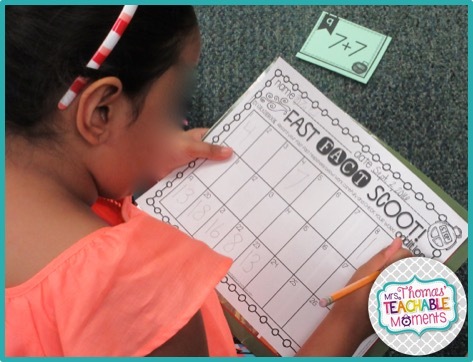 We focus on Touch Math, making 10, doubles, doubles +1, counting on, and related facts. Research shows that long-term success in math is closely tied to having strong number sense. This includes having fluency with basic facts. 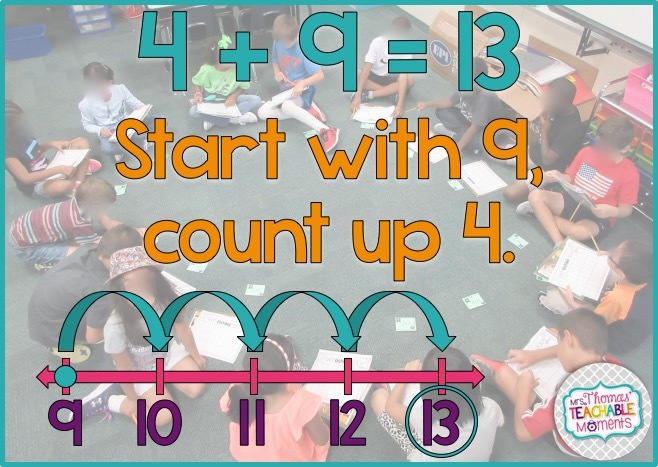 Math only gets more complicated the further along the children go, and expending mental energy counting to solve addition and subtraction facts is a waste of their time. Automaticity does not happen overnight, and it shouldn't simply be a memorization of facts. It is usually acquired in a certain order. First, children begin by understanding that numbers represent quantities. They typically learn about this in pre-k and kinder. Second, they can begin using procedures to figure out facts. They develop ways to remember facts through strategies. (This is where we began this week). Third, children can achieve recalling facts with automaticity. I love this video, but I wish the quality were better and that it had the lyrics and facts captioned on-screen. It would be more effective that way, but, beggars can't be choosers, right?! 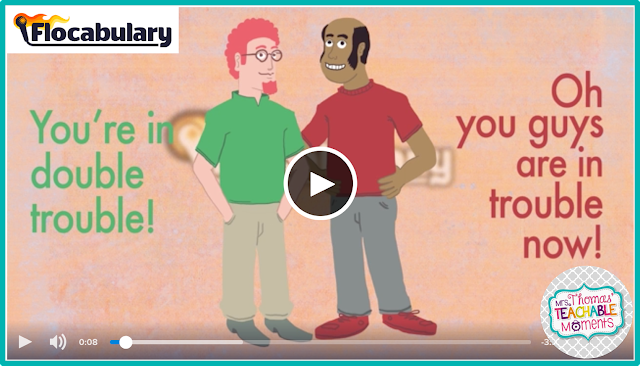 However, Flocabulary has an AWESOME video about doubles! Do you guys know about Flocabulary? Think Ron Clark meets YouTube. All the awesome songs about every content area, but in an animated form with subtitles. My kids LOVE it! (And I do, too!) . 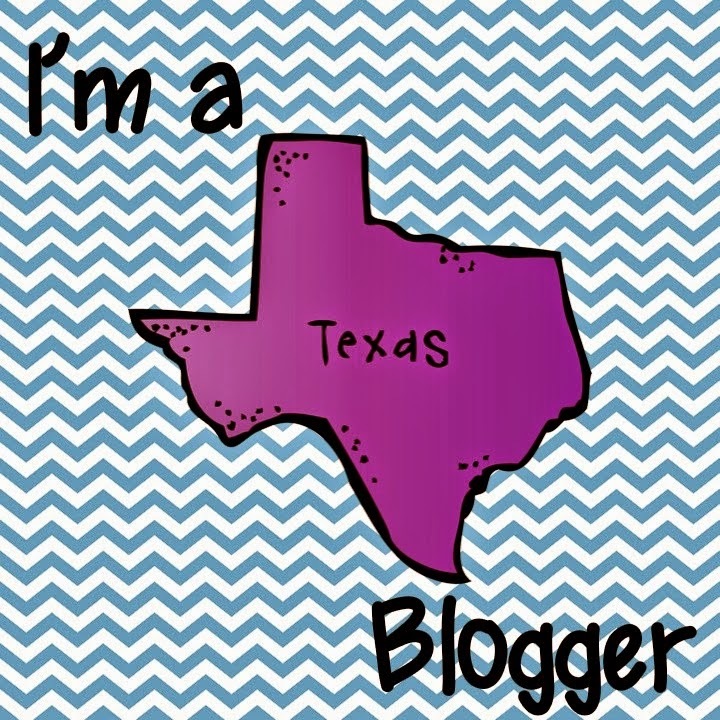 My district pays for our subscription, but they have a free trial if you want to check it out! 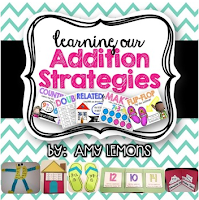 We used a couple of things from Amy Lemons' packet called Learning Our Addition Strategies. This has a copy of the lyrics to the Doubles Baby rap. I made a copy of for each student to glue into his or her math journal. Then, we made the Double's Dude craftivity to reinforce that strategy. They are super cute AND give the kids a visual reminder of the doubles strategy. We also focused on counting on. 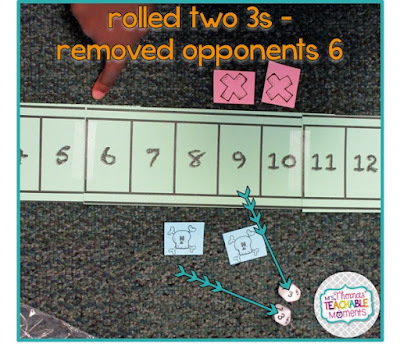 We glued in the little poster from Amy Lemons' product, and then played several games to practice this strategy. (See games pictured below). The counting on strategy teaches the children to begin by counting with the largest number and then add the smaller number on to it. This seems obvious, but children often add numbers in the order in which they appear instead of determining the fastest way to get to the sum. 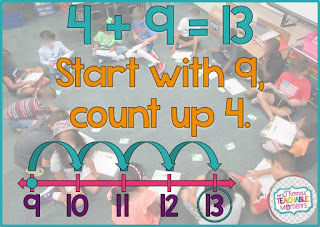 (This strategy will also come in handy when we start adding more than 2 numbers at once). To practice counting on, we played a fun partner game called "Walk the Plank." The kids love this game. I play it every year. The students have a "plank," playing pieces, and dice. I use 10-sided dice so they can add numbers all the way through 20. They roll the dice, add the two numbers together, and then remove their opponents playing piece that is next to that number. You can click here to see how to play the game. 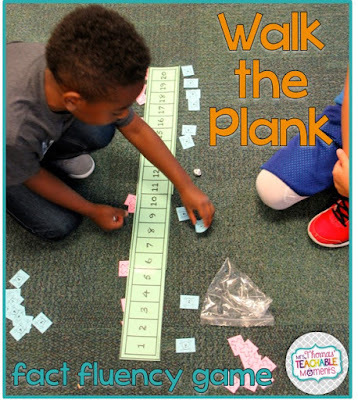 Click here to get Walk the Plank for YOUR classroom. We also played a game of Fast Fact Scoot! created by Schroeder Shenanigans in 2nd. Automaticity is usually achieved in small increments. We focus on one or two sets of facts, and then we build upon those. Then, once those are maintained, we build with another set of facts. 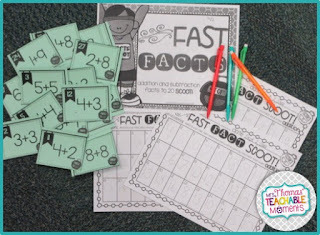 I hope your school year is off to a great start and that you can incorporate some of these activities and strategies into your math instruction! Make each moment a teachable one!